In every civilized jurisdiction in the free world, an attorney who steals a client’s money is at the very least disbarred, never to practice law again. Lawyers who “borrow” (real world word = “steal”) from their trust funds usually end up doing a couple of years in jail. All over the world, the legal profession and the courts treat theft and misuse of clients’ funds as one of the most serious offenses a lawyer can commit. There is no “gray” area when it comes to the sanctity of monies entrusted to a lawyer. The discipline committees and the courts hammer lawyers for breach of trust involving money because they know that the very credibility of the legal profession is threatened. Honest lawyers know that if their Bar Association and the local Courts don’t come down hard on offenders, it undermines the entire legal system – lawyers, judges, the courts… everything. Stiff penalties awarded by the disciplinary committees and the courts also act as a deterrent. Lawyers who might consider using their trust account funds to short some stocks or to cover the purchase of a new car “only for a few days and then I’ll put the money back” think twice if they know that getting caught means the end of being a lawyer forever. It has now been clearly established that the Barbados Bar Association does not consider it a big deal for a lawyer to steal $130,000 as long as the lawyer returns the money when caught. According to the Disciplinary Committee of the Barbados Bar Association, a simple reprimand is a suitable penalty. No disbarment. No criminal charges. No Jail. The lawyer-thief will not be disbarred, and is free to continue to practice law in Barbados. That, my fellow citizens, is a national disgrace. More than that, it threatens our status as an offshore center for finance and corporations and it dirties the reputation of every honest Barbados lawyer. In 1999, Michael Atkins of England retained Barbados attorney Mortimer Clarke of Sui Juris law firm at Crichlow Alley, The City, to handle a Barbados real estate deal for him. Mr. Atkins needed a lawyer to close the deal, receive the money and do the legal necessities. Boy… did Mr. Atkins pick the wrong lawyer! Attorney Mortimer Clarke collected $150,000 but didn’t pass the money on to his client, Mr. Atkins. Attorney Clarke kept the money. Then in 2002, after three years of Mr. Atkins clamoring for his money, Attorney Clarke gave him $20,000 of the funds. That was it. In other words… Mortimer Clarke stole the funds from the real estate transaction and used the money to pay his own expenses… and “among other things” – the details of which are being concealed by the courts and/or the Nation News. So what did the Disciplinary Committee of the Barbados Bar Association think was an appropriate penalty for Mortimer Clarke? Nope… a “reprimand” was the penalty assessed. That’s all, folks! Give the guy a break. After all… once he was caught, Attorney Clarke paid back the stolen money! And Mr. Clarke could have escaped with only the reprimand except that he failed to repay $35,407.04 in interest and travel expenses incurred by the victim of the lawyer fraud – Michael Atkins. 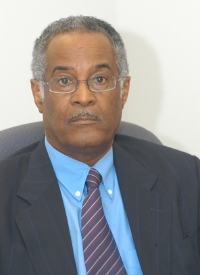 Which leads us to the current situation where the President of the Barbados Bar Association is placed in the outrageous position of appearing before Chief Justice David Simmons to argue that the reprimand imposed by his own Disciplinary Committee is not good enough unless Clarke pays the interest and travel expenses! According to the Nation News, Chief Justice David Simmons is to rule on this situation, but we wonder how he will view the situation. Will he consider the overall integrity of the legal profession? Or… like the time he defended Ezra Allyne for misappropriating a client’s money in a similar situation, will Sir David feel empathy with a corrupt lawyer? In the case of Ezra Allyne, Allyne was required to repay money to a client for a failed real estate deal… but couldn’t because… doan ya know… the client’s money wasn’t in Ezra’s trust account any longer! Ezra was suspended for three years, but it looks like David Simmons got him off on a technicality. Have a read of the court record here and make up your own mind about what David Simmons did then and will do now with this new case of a crooked lawyer taking a client’s money from his trust account. Chief Justice Simmons… Are YOU going to rubber-stamp this cover-up of a lawyer who stole $150,000 from his trust account? By imposing only a “reprimand” for the theft of $150,000 of foreign investor’s money, the Barbados Bar Association has destroyed the credibility of every lawyer on the island. A greedy, dishonest lawyer has been given a pass by the “old boys” network at the Bar Association. We’ve got news for the “old boys” of the Barbados legal profession – this isn’t like the old days. You can’t cover up for Mortimer Clarke. You can’t hide your disgusting failure to deal with this breach of trust. Why should foreign investors now trust any Barbados lawyer with money? You’ve just proven to the world that our breach of trust standards are so low as to be absolutely no deterrent. A clear case of a lawyer involved in a $150K fraud – and the Barbados Bar Association thinks a simple “reprimand” is appropriate. Again we ask the members of the Barbados Bar Association: Why should anyone trust a Barbados lawyer? Tell Us Your Lawyer Stories! The greedy, dishonest lawyers and the Barbados Bar Association have destroyed the credibility of the island’s lawyers, but we know that the current story is just the tip of the iceberg. We’ve all heard the tales of estates handled by Barbados lawyers… still not settled after 15 years. We’ve heard about the parents’ estate where the lawyer ended up living in the parents’ home! And who could forget about the famous signature move practiced by many Barbados lawyers, called “Handling both ends of the deal without telling the client”. Monkees in a barrel. Or perhaps, Crabs in a barrel – destroying their own legal profession, forgetting honour and the law in their quest for filthy money.